Viridian is a Portland, Oregon-based reclaimed lumber company. It was established in 2004 with a noble intention of preserving natural resources (trees) through up-cycling dockside discards such as shipping pallets, crates, and other scrap lumber to produce valuable reclaimed lumber products. Now, Viridian collects old lumber from old schoolhouses, barns, and local shipyards. With their craftsmanship, Viridian woodworkers turn this reclaimed material into internationally acclaimed products. Viridian gives equal importance to the proper collection of old lumber, making the best use of collected woods through excellent craftsmanship and attracting general people to buy and use their reclaimed lumber products. Viridian takes special pride in manufacturing architectural panels, flooring, table/countertops, decking, and beams. It sells its products across North America through its website. Duluth Timber Company is a Duluth, Minnesota-based reclaimed lumber company operating in Duluth, Minnesota and Edison, Washington. It is one of the first “FSC-Recycled” certified reclaimed lumber company in the US. For about 30 years, it has been supplying premium quality reclaimed lumber to homeowners, architects, and craftsmen all across North America. It collects old lumber from old barns, factories, and warehouses, tank stocks and trestles throughout the country. Duluth Timber Company provides a range of products including customized furniture, artisan applications, custom millwork and paneling, custom cut Douglas fir timbers, and wide plank wood flooring. It has its own milling facilities to produce attractive cabinetry, stair treads paneling, and siding from reclaimed timber. Longleaf Lumber has a milling facility in Berwick, ME, as well as a showroom and retail warehouse in Cambridge, MA. 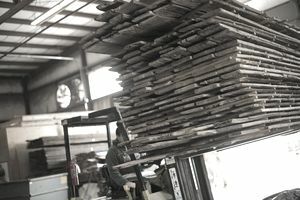 Longleaf also offers its various reclaimed lumber products and services to customers across the country through its website. It collects old Hemlock, Spruce, Maple, Hickory, White Pine, and Oakwood from old barns and historical buildings. It takes special pride in making premium quality wooden tongue and groove flooring. Longleaf also produces moldings, stair treads, cabinets, counters, and wooden furniture. Additionally, it sells beams and boards. Longleaf Lumber’s major customers include homeowners, furniture and cabinetmakers, architects, interior designers, and other contractors. For over a decade, MRL has been providing quality historic trim and paneling, antique boards, reclaimed beams to its clientele. MRL operates in the southern reaches of Gallatin Valley, Montana. It boasts of one of the finest collections reclaimed wood in its locality. It has its own milling and warehouse facilities to process and store reclaimed woods. It's milling facility features a 12,000 board-foot dehumidification kiln. MRL provides its customer with quality reclaimed lumber products and customer service. Reclaimed lumber is an opportunity well worth exploring.